But we might want to get the list in a comma separated string like “10-100, 10-101, 10-102”. There is no native SQL function for that. MySQL conveniently offers GROUP_CONCAT() which works as an aggregate function. When using the Access backend, the answer is to use VBA function to string up the records as a string. An example of such VBA function can be done here. 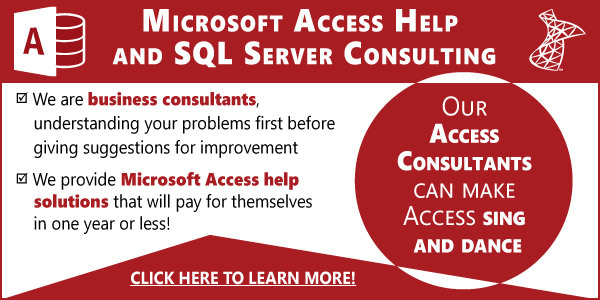 But when using SQL Server, it is possible to approximate the functionality of MySQL’s GROUP_CONCAT() function. That’s good and all but we’re more interested in getting a single string concatenated from a set of rows. Let’s add a comma and leave the root element blank. Much closer! Now you can see how you can use XML PATH to easily convert a set of rows into a single concatenated string. Of course, we don’t want the leading ‘, ‘ so we need to clean that up. The trick is that we need to do the string formatting after the XML PATH query, not within. Otherwise, any formatting may end up being part of the XML output which would look funny. We can do that by putting the above expression in as a subquery. Suppose I want to change ‘world’ to say ‘planet’, I would need to have two things; the position where the word ‘world’ starts, which is 8 and the length of the word, which is 5. It should be apparent that we’re taking out the first 2 characters, which is the leading comma and space that the XML PATH added to the first record with a zero-length, effectively chopping off the leading comma and giving you a proper list. Now, let’s put it to work. As mentioned at the start, we want to list all past due orders per company and only list companies that have upcoming orders so that they can ensure the past due balance will be settled before the new order go out. Note that we use a correlated subquery. This is necessary because the FOR XML PATH effects the entire statement; you cannot apply FOR XML PATH to only one table or column. So we can’t just join all tables together in a single query. Furthermore, Since FOR XML PATH will output only one record per a query, and we want to list strings for each different company, we put in a filter referencing the outer query, “x.CompanyID = o.CompanyID”. Using the EXISTS clause, we can restrict to only companies that are in arrears. Bonus: VBA has STUFF(), almost! Mid(strTest, 8, 5) = "Planet"
The output is “Hello, Plane!” Note how Mid() has an assignment, which makes it a statement and not a function since we’re essentially assigning a string variable to the result of Mid() and therefore altering the original string expression. Unlike T-SQL’s STUFF(), though, you cannot put in bigger word and see it expand accordingly. That’s why we only got “Plane”, not “Planet”, since the latter is one letter longer than the original “World” that it replaced. As you can see,T-SQL offer plenty of functions for you to make best use of query and do so without any coding. What other novel uses have you found?